Amazingly prescient of the newly-erupting Hawaiian volcano, Kilauea, E.J. Wilson's highly-anticipated new novel is NOW LIVE! in Paperback and Kindle! Enjoy this sneak preview of the breathtaking cover art, and below that, the beginning of Chapter 1, Bokeb the Maker. 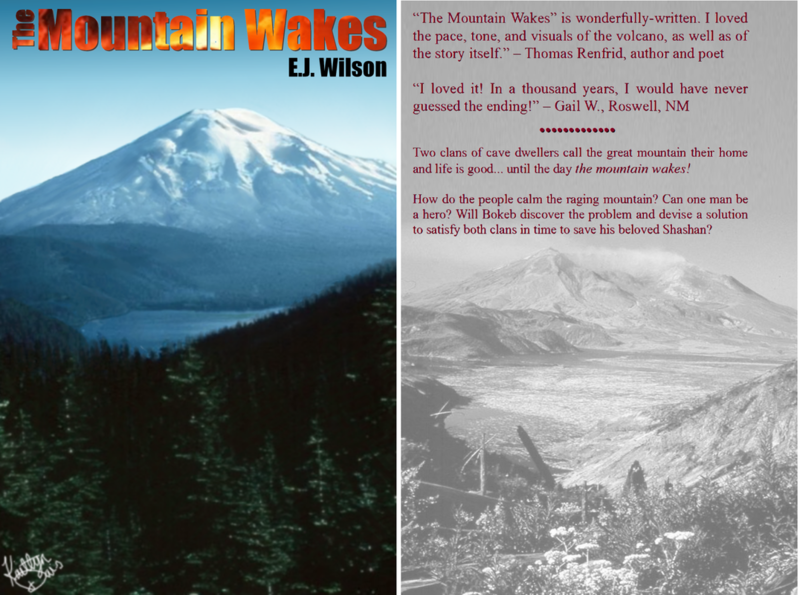 The Mountain Wakes is LIVE! Click the picture to continue to the order page or scroll down for more. Du Bokeb had a problem, and only one day to solve it. Yala appa, no fire. He liked to think he was good at solving problems, but he caused this one, and was in a bit of trouble for it. Other fires could be permitted to die during the night while the people slept, but this fire was different. This was the clan fire. It was started under the supervision and blessing of the elders, who sang the sacred incantations to bless it. It was the fire everyone depended on when theirs went out overnight. It was Bokeb's turn to watch over it and keep it fed, but the night didn't go as planned. While staring at the flames, he let his mind revisit the events of the day. They had been on a hunt. Someone in the clan had told his cousin Tul of naked pigs that were seen by the wide trail beneath the path of the white birds beyond the lake. Tul believed what he heard, but Bokeb said he would need to see one with his own eyes. Pigs with no hair? It didn't seem possible. How would they survive the cold season? show they could be big, so Tul and Bokeb went by themselves. Just as the sun appeared full, they ate a breakfast of dry deer meat and got on the trail. They took spears and empty water skins that they would fill at the river. Bokeb decided if there were no naked pigs, they could still catch a boar and have a nice dinner. “Then you were thinking of her,” Tul broke out in one of his famous grins. “Only compared to you, Cousin Tul.” Bokeb answered with a smile, and they both laughed. “While we're talking about who we like,” Bokeb added, “what about Nua? She likes you.” He gave Tul a teasing nudge and grin. After walking as far as the lake, and then the same distance again, they found the wide, smooth path, but no naked pigs. No sign of naked pigs. No tracks of naked pigs. Bokeb had walked enough, and Tul agreed a boar would feed them just as well, hair and all. On the trail back, the hunters didn't find the boar. It found them. With an angry, loud, high-pitched cry, it immediately charged out of the brush onto the trail, running right for them. Tul was in the lead, so it reached him first. He swung a massive blow at its head with his club, but missed. The momentum of the swing pulled Tul off balance. He shouted “Bokeb, aggo kai!” help me! as he jumped out of the boar's way. Tul came down painfully with his ankle sideways and ultimately landed on his back. The boar turned sharply toward Tul and charged again. Bokeb bravely challenged the raging boar, making barking noises and running toward the animal to distract it from Tul. Tul frantically waved his club in front of himself while struggling to get up. Bokeb thought of throwing his spear, but it was too far away for a certain kill. Instead, he kept running toward the beast as fast as he could, making as much noise as possible. have been much easier if the boar charged him as it had charged Tul. Boars can hear and smell better than men, but their vision is terrible. If the boar had simply continued charging Bokeb, instead of turning to attack Tul, by the time it saw Bokeb's spear, it would have been too late. Running through the forest like this proved again that Bokeb was not a runner. He was too big and heavy to run very fast for very long. Tul was the runner, tall and thin with long legs, but he wasn't much help. Bokeb chased the boar through the forest for quite some time until his spear found it's mark between the animal's shoulder blades and stopped it dead. Normally, the two hunters would have carried the boar on a tree branch between them, but Bokeb alone was forced to hoist it onto his shoulders for the long walk back while Tul trailed behind, limping and complaining about his ankle the whole way. “I saved your life,” Bokeb called over his shoulder. “If you did, I wouldn't admit it,” Tul replied. Just thinking about it made Bokeb even more tired than he already was. He blinked the haze out of his eyes and looked away from the flames. Then looked back. He shook his head to try to clear it. Before sleep overtook him, his last thoughts were of her, the mountain girl he had seen from the ridge. It was a hand of days ago, and he has thought about her ever since. He had climbed a tree to check the surrounding area for bears, when he saw her. She was washing herself in the lake in the valley, her hair glistening in the sun. She was a juvenile about his own age, and it was not the first time he had seen her. This makes more than a hand of times he'd seen her since he was big enough to hunt.